Dublin dentist, James Huang specializes in diagnosing and treating all forms of gum disease, which includes treating the related damage to the teeth and jawbone that results from gum disease. Periodontal disease affects the teeth, gums, and overall health of your mouth in general and is caused by the buildup of plaque on the teeth and below the gumline. Plaque is caused by food debris and bacteria that sticks to the surface of the tooth. When plaque builds up due to things like lack of regular brushing of the teeth, it can harden and create a calculus or tartar on the teeth that cannot be easily removed by brushing or flossing. If your dentist discovers that you are experiencing some degree of periodontal disease, a treatment of some form will be highly recommended. If left unchecked, periodontal disease will advance and can cause extreme problems like tooth or gum loss as well as oral discomfort and pain. Periodontal treatments vary by need. 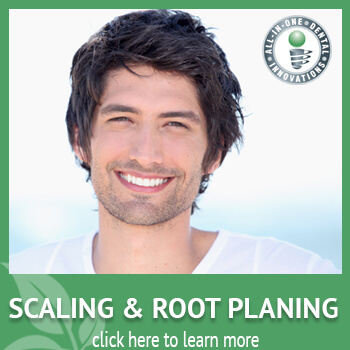 Root planing and scaling is a common procedure for periodontal disease. It is a professional deep cleaning that goes beyond a routine tooth cleaning by detailing each surface of every tooth and below the gumline. For cases of an advanced periodontal disease, a more extensive solution may be required. Dr. Huang will discuss individual concerns case-by-case to find the best solutions for your needs. Research has also noted that pregnant women are more likely to contract periodontal diseases. You can only avoid periodontal diseases with sound oral hygiene habits and regular visits to a dentist. However, there are certain signs that clarify what periodontal disease is and which can help you identify whether you’re already suffering from it. Periodontal disease is caused by plaque buildup, and if left untreated the food debris, bacteria, and saliva that sticks to your teeth and your gums develops into a tartar which dentists refer to as calculus. As your plaque and calculus rest on your teeth and gums, they work to decay your teeth and attack your gums and bones, making your mouth more susceptible to bacterial infection. If you experience any of the symptoms listed below, contact us today to see if you have periodontal disease, and how Dr. Huang can help you overcome your dental issues. If you are suffering any of these symptoms, call our Dublin dental office so that Dr. Huang can consult with you at our Dublin office on the best treatment options for your unique situation. At All In One Dental Innovations, we invest in the technology to provide our patients with effective and efficient care. When you’re experiencing symptoms of Periodontal Disease, you should take them seriously in order to preserve your smile. At All-in-One Dental Innovations, Dr. Huang believes in working with his patients to prescribe preventative techniques that ensure long-lasting oral health. To determine whether or not you suffer from periodontal problems, All-in-One Dental Innovations will administer a periodontal examination. This is done with all of our patients. A periodontal examination should be a routine part of your regular dental check-up and should be done at every dentist office that you attend. What Happens During a Periodontal Examination? Gingivitis – Gingivitis is the inflammation of gums. Your gums can be inflamed due to the bacteria that forms when plaque has built up. Early gingivitis can cause the gums to be red, inflamed, and bleed during brushing. At the early stages, the teeth are still in their sockets and there is no bone or connective tissue damage. If gingivitis is not treated and progresses, that is when it can develop into periodontitis. Advanced Periodontitis – If your periodontitis is not treated, it becomes a repeated cycle and will only continue to get worse as time goes on. As it gets worse, the pockets between the teeth will become larger, the enzymes and bacteria continue to break down the bone and connective tissues, and eventually, your teeth can become loose and will come out of their sockets. You will have significant bone loss at this point and will start to lose teeth. The leading cause of adult tooth loss is periodontitis. It is very crucial to not let your periodontitis get to this point. When it reaches this point, you may have non-repairable bone loss and might need implants or dentures to replace your teeth. This can be a very costly and lengthy fix. It is important to get examined if you notice any unusual tenderness or bleeding from your gums. At All-in-One Dental Innovations, we strive to personalize periodontal treatments to the unique concerns and needs of each patient. Dr. Huang will personally determine the best treatment for each patient and their periodontal needs. Why does my periodontal problem need treatment? As periodontal problems get worse and turn into periodontitis (gum disease), it can cause many serious problems and concerns. If your gingivitis (gum inflammation) is treated early enough, it may be reversible before turning into periodontitis. Periodontitis needs to be treated as early as possible because if left untreated, it could cause: bone loss that may not be curable, connective tissue problems or loss, and can cause your teeth to come out of their sockets and eventually fall out. What periodontal problems does Dr. Huang treat and how? Advanced periodontitis – At this stage, it poses severe risks to your oral health. If you suffer from advanced periodontitis, you will be at serious risk for tooth loss as your periodontal disease slowly destroys the gum and bone structure that holds your teeth in their sockets. At All-in-One Dental Innovations, we are prepared to treat your advanced periodontal disease with a procedure known as scaling and root planing. During a scaling and root planing procedure, Dr. Huang numbs one quadrant of your mouth, removes tartar, plaque, and toxins from above and below your gum line (scaling) and smoothes any rough spots on your root surfaces (planing). 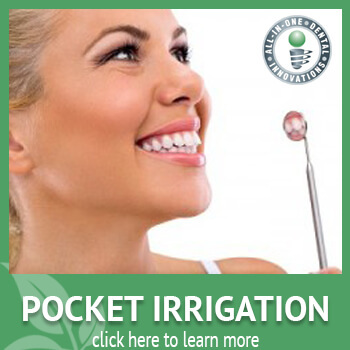 A successful scaling and root planing procedure will allow the pockets between your gums and teeth to shrink. Dr. Huang may recommend medications, medicated mouth rinses, and an electrical toothbrush to ensure sound healing, and prevent further infection. If your scaling and root planing procedure is unsuccessful, you may need to undergo periodontal surgery to reduce the depths of the pockets between your gums and teeth. Dr. Huang may also recommend you see a periodontist (a dentist who’s specialty is in gums and their supporting bones). Tartar (calculus) can form in your mouth in as little as 24 hours of neglecting to clean your teeth. This is why it’s important to brush your teeth every day. However, there are places in your mouth that are hard to reach they will always be at extra risk for complication. After successfully undergoing periodontal treatment, Dr. Huang will likely recommend that you have regular maintenance cleanings around four times a year. Dr. Huang will thoroughly inspect the depths of your gum pockets to make sure they are at a healthy level. At these checkups, Dr. Huang will meticulously remove the plaque and calculus that builds up above and below your gum line in order to avoid future periodontal problems. As part of our commitment to the most contemporary dental technology and methods, we routinely recommend that our patients have x-rays taken to detect any signs of tooth decay, tumors, cysts, bone loss, and to check the tooth and root positions. In the event that Dr. Huang does detect a serious dental health concern, we will work with you to resolve your dental health problems. 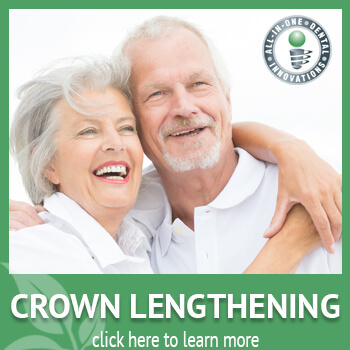 Have you already been treated for a crown, bridge, filling, or undergone a different restorative procedure? Dr. Huang will make sure that your dental restorations continue to healthily support your teeth, gums, and smile. In addition to your x-rays, Dr. Huang will examine your face, neck, lips, tongue, throat, cheek tissues, and gums for signs of oral cancer. Dr. Huang is committed to preventative dentistry so that you do not encounter future dental or periodontal problems. That’s why Dr. Huang meets with all of his patients to after their procedures to suggest sound habits for your home dental routine. Good oral hygiene practices are essential in controlling periodontal diseases. Even if you brush, floss, and rinse with mouthwash every day, you may not be able to remove every particle of plaque left in your mouth. At All-in-One Dental Innovations, we help every patient polish their teeth so that they have healthy and shining smiles. Contact All In One Dental Innovations Today! As you can see, periodontal disease treatment involves many steps. Dr. Huang has devoted his energy and focus to make sure that you get the care you need. Contact All In One Dental today at (925) 828-9811 or by requesting an appointment online.